Eerie Britain author MATT FORDE asks: Is the picturesque northern seaside town of Whitby, a gothic portal to the spirit world? The North Yorkshire Moors are an ancient landscape, brimful of fascinating histories and intriguing folklore. This is a land where undulating moorland gives root to wind-bent trees, rocky cliffs jut jaggedly from Jurassic strata and clusters of oak, ash, birch and rowan offer quiet havens to wildlife of all kinds. 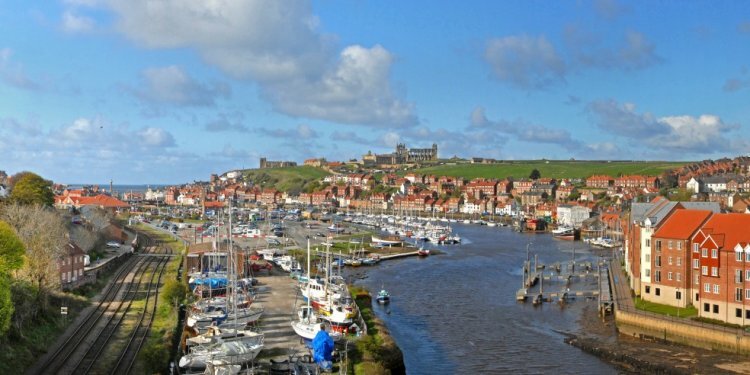 Venture out to the Moors’ north eastern edge and you’ll find one of the most enduring and mysterious places in Britain: Whitby—a place long considered a ghost hunter’s paradise. Whitby nestles between two cliffs, straddling the 28-mile-long River Esk as it empties into the cold North Sea. It is a strikingly pretty place, criss-crossed by cobbled lanes that meander between higgledy-piggledy rows of shops and red-roofed cottages. The town’s eastern skyline is capped by the skeletal ruins of its Abbey of St. Hilda. This Benedictine abbey is grade one listed and stands next to another venerable grade one building, St. Mary’s Church. Together they dominate the east bank, the Haggerlythe, and are reached by climbing the town’s famous Church Stairs, or ‘199 steps’—something of a trial of stamina for the less athletic visitor. The Abbey dates from 657 AD and has had a rich and turbulent existence, hardly surprising then that it is supposed to be haunted. Its first abbess, Hilda, was a truly remarkable and wise figure whose efforts to spread Christianity and encourage education in the area led to some of the earliest Anglo Saxon poetry and literature. Even now, Hilda is inextricable from the ruins and her shroud-wrapped spirit is said to manifest at different points around the Abbey’s grounds and—most famously—in one of the topmost windows, usually during the late morning hours. Spectral nuns and strange choral harmonies are also experienced near to the Abbey. The executioner lopped off his head in a single skilful blow. According to some, Bushell might still be lingering on at Bagdale Old Hall. If the tales about his ghost are to be believed, he manifests as a strange, ethereal shape that moves around the staircase and produces clattering footsteps that travel up and down its stairs. One report even stated that his headless torso has been seen silhouetted against a window. Perhaps it is Bushell who is also behind the poltergeist activity at Bagdale, where pots and pans have been flung around the kitchen and lights switched on by themselves. Is this the reason why the building remained empty for a long time? Or was it because of the disembodied children’s voices that have been heard, sometimes whispering, sometimes playing and sometimes crying? Whitby’s historic landmarks continue with its two harbour lighthouses. Standing proudly at the tips of the harbour’s piers, the lighthouses have helped to guide mariners into port for over a hundred-and-fifty-years. Both are haunted. Run by the Port of Whitby, the stone-built, 83-foot-tall west lighthouse is open to the public during the tourist-filled summer months and is still partly in use, displaying a green light when a boat is expected to come into the harbour. This lighthouse is frequented by the one-armed ghost of a local man who “tended the lights” and is thought to have keeled over one day on the stairs inside the lighthouse on the West Pier, soon expiring of a heart attack. Authors seem divided as to whether the man’s arm was severed in life when he fell to his demise, or whether it was an old injury. Either way, he seems to want a similar fate to befall others, because he is supposed to lie on the stairs inside and occasionally try to trip up unsuspecting visitors.